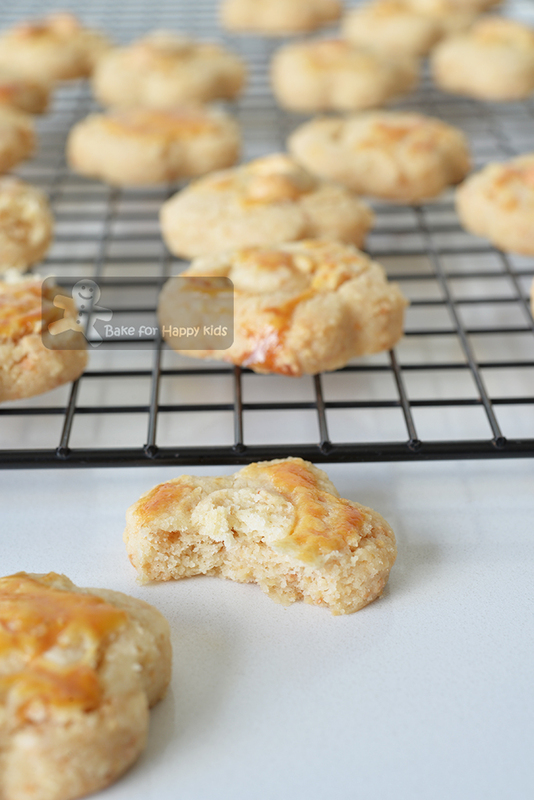 Bake for Happy Kids: The Ultimate Melt in the Mouth Chinese Cashew Cookies 腰果酥 Extremely addictive! 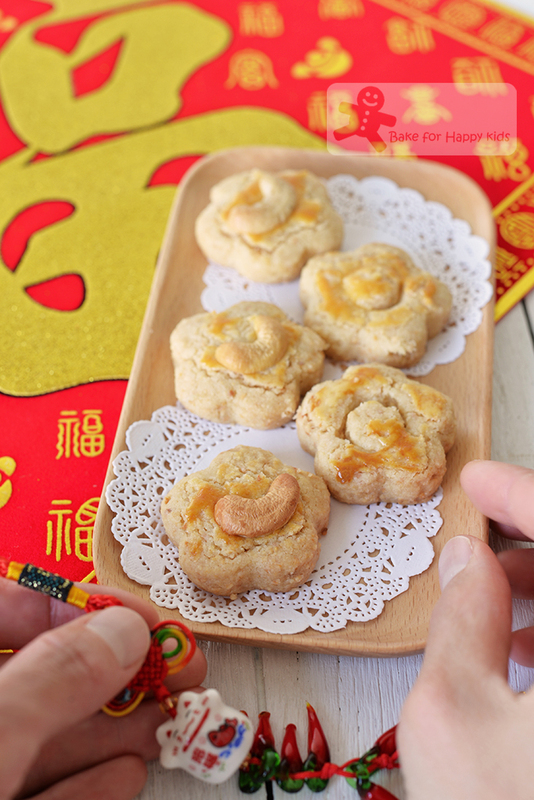 The Ultimate Melt in the Mouth Chinese Cashew Cookies 腰果酥 Extremely addictive! Same cookie recipe. Different nuts. Different taste! Different texture! 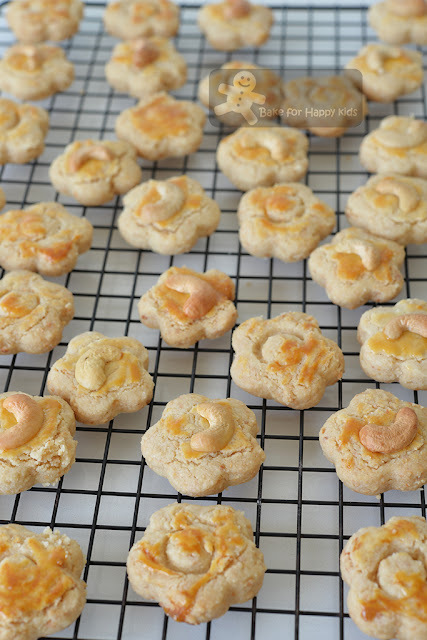 After tasting and loving the sweet, salty, crunchy almond cookies that I baked with recipe one at here, the curious me wonder if I can use the same recipe to bake cashew cookies. Of course, I can but due to the fact that cashew nuts are nutritionally very different from almond, these cashew cookies turns out to be very different. Very different yet very very very yummy! So yummy that these melt-in-our-mouths cashew cookies are extremely addictive! HELP!!! We can't stop eating these... LOL! Comparing almond and cashew nuts by weights, I'm surprised to learn that the creamy cashews nuts contains 44g fat per 100g which is lesser than almond nuts (49g fat per 100g). The cashew nuts are creamier because they contain 8g saturated fat per 100g and the almond nuts contains only 3.7g saturated fat per 100g which is less than half the saturated fat in cashew nuts. "Mum, I like cashew nuts more than almonds." I know... It is pretty obvious!!! Cashew nuts are tastier because they contain 6g sugar and 12 mg sodium per 100g whereas almond contain 4g sugar and 1 mg sodium. So, which nut is healthier? Almond, of course! Although both nuts are about the same in their protein content (cashew 18g per 100g, almond 21g per 100g), almond contains 12g dietary fiber which is 4 times more than 3g per 100g dietary fiber in cashew nuts. Less sugar, less sodium, much more dietary fiber... Almond is obviously a healthier nut to eat! So, which nut makes better cookies? Cashew, of course! LOL! One: Use cookie cutter with simple shapes. These cashew nuts cookies are very crumbly meaning that if you cut the cookies into fiddly shapes with sharp and tiny corners, it will make the cookies break into pieces very easily! Two: Do not use large cookie cutter to cut the cookies. The largest size of the cookie cutter I would use is 4 cm in diameter. Anything smaller than this size is ok! ... but anything larger that this size is a NO NO!!! ... because these cookies that are larger than 4 cm in diameter will break very easily. Three: It is a must to glaze the tops of the cookie dough with egg wash. If you prefer your cookies to be firmer so that they are sturdier to handle, you can either 1) dry the applied egg yolk wash for approximately 15 mins and then brush a second layer of egg wash or 2) use whole egg instead of egg yolk as your egg wash but the whole-egg egg wash will make the cookies less melty. Four: Must roast cashew nuts before processing it. I must confess that I had been silly enough... to process cashew nuts before roasting them. The un-roasted raw cashew nuts are soft making the blades of the processor kind of difficult to cut through and may potentially fry your processor. Hmmm... So, always remember to roast cashew nuts first then process them later. Five: Do not over-process cashew nuts. Over-processed nuts will make the ground nuts become pasty and oily like peanut butter! LOL! ... and will eventually make the cookies too oily to touch and less melty to enjoy!!! Six: Do not reduce the sugar added any further! After baking many types of cookies, I have noticed that the reduced sugar added into the cookie dough will make the cookies more melty. However, in this case of extremely melty cookies, you don't want to reduce this amount of added sugar any further. These cookies are nutty with the right amount of sweetness and saltiness for us and if you are not happy with the taste or want the cookies that are absolutely not sweet at all... Tell me about it. I have came across readers who want their food to be totally sugar-free. Then, I would rather you not to use the recipe. Please find another one!!! Seven: Do not knead the dough. Kneading and over-working the dough will make it releasing more oil and will make the cookies tougher. Eight: Use cake flour with low protein content to dust. The cookie dough made with ground cashew tends to be moister and wetter than the one made with ground almond and so you will need a lot more flour to dust while rolling and cutting the cookies. To maximize their melty taste, you should try to use the minimal amount of flour to dust and use cake flour with low protein instead of all purpose / plain flour to dust while rolling. To make the cookie dough, you MUST use plain / all purpose flour or else your cookies will fall apart very easily! Nine: It is a must to leave the freshly baked cookies to cool slightly on the baking tray for about 10 mins! Then, transfer the cookies onto a wire rack to cool completely. Hot freshly baked cookies will break very easily!!! Ten: These cookies are too melty for you!!! Are these melty cookies too difficult for you to bake and handle? I know. I don't recommend you to bake these ultimate melty cookies if you have to stack these into big jars and transport them to sell. Sorry that I can't suggest any more baking tips further... but you can use another melt-in-the-mouth Chinese cashew butter cookies recipe which is going to be published my next post! What is difference? My next Chinese cashew butter cookies are melty too with pockets of buttery crumbs and they are way more sturdy to handle. Interested? So stay tuned. ... but these cashew cookies are very different from almond cookies! ... because every mouthful of these are super melty and super addictive! "Mummy, these are one of my favourite cookies! They are so melty!!!" Here's a video showing how I baked these ultimate melty cookies. BEWARE that the cookies are fragile because they are very very very melty. Like my Chinese New Year baking recipes? Here's this Ultimate Melt-in-the-mouth Cashew Cookies recipe. To pre-roast the nuts, spread nuts in the prepared tray in thin layer and bake at 180ºC for 10 mins or until golden and fragrant. Set aside to cool completely. To grind the cashew nuts, process the roasted nuts in small batches with short pulses plus stirring in between the pulses until the nuts are finely ground but please do not over-process cashew nuts. - see the above tip 5. Combine flour, sugar, baking powder and salt in a large mixing bowl. Then, use a spoon or spatula to mix in the ground cashew until combined. Add oil into the flour mixture and use a spoon or spatula to mix until all are incorporated. Then use your hand to combine the crumbs into a pliable dough. Do not knead or over handle the mixture. Dust rolling pin and non stick surfaces (like baking paper) generously with cake flour. Use the rolling pin to roll cookie dough to about 1 cm thick. Cut dough with cookie cutters. Transfer and arrange the cut dough onto the prepared baking tray with about 1-2 cm apart. Gather scraps and continue to roll and cut out dough until the dough is used up. Use a pastry brush to lightly glaze the top of the cookie dough with egg wash. Brush the first coat of egg wash mixture onto cookie dough. If you prefer the cookies to be firmer, let the first layer of egg wash dry for approximately 15 mins, then brush on the second layer - see the above tip 3 but mine work well with just one layer of egg wash.
Decorate the cookies with extra cashew nuts if desired and bake for 15 mins, or until the cookies are slightly golden. Important: Depending on the shapes and sizes of the cookies, please note the baking duration and number of cookies yielded can vary. Leave to cool slightly on the baking tray for about 10 mins to a wire rack, then transfer the cookies to cool on the wire racks to cool completely. Store cookies in airtight container when they are completely cooled. Hi Zoe: can I use melted butter instead of veg oil? U egg-washed cookie before garnishing with nut...ok if i place the nut on cookie then egg wash nut? will nut get burnt? Hi GC, Yes that you can use melted butter to bake these cookies but oil will make them more melt-in-the-mouth. Yes that I applied the egg wash on the cookies before decorating them with extra nut and you can place the nut first and then do egg wash later. It's ok too. Cheers!